Its going to be a hot one in Kamloops today. 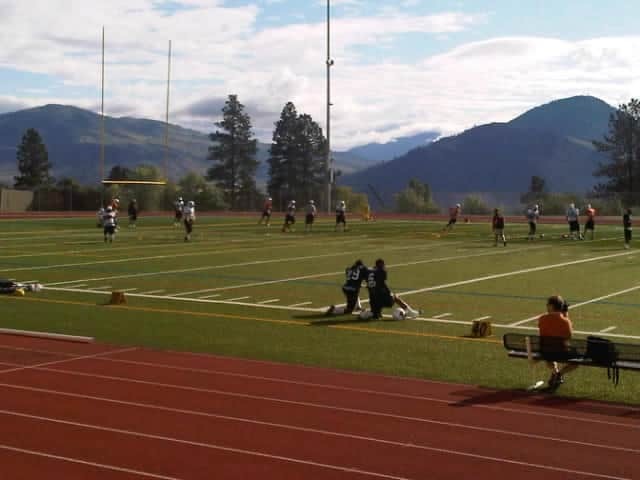 The players have taken to the field under sunny skies and a mountain backdrop. 8:15am: Positional groups have broken off for technical drills. Receivers, backs, secondary, offensive line, QB’s. 8:35am: Sherko Rasouli entertains the troops during warmup with an inspirational speech from the movie 300. 8:59am: Printer under centre, as the offense runs some routes.. Printers looking sharp again to start the day. Tony Washington receiver has caught everything thrown his way to date. 9:08am: Defence working on coverage assignments. Once again this practice is all business. Wally’s desire for a stronger work ethic seems to be in motion. 9:27 after some route and coverage drills the offense and defense are going at it. Tons of chatter on the field. Geroy gets hit hard over the middle. He’s fine. Tony Washington is the star of this session. 9:36am: Not a lot of catches being made in these drills with the exception of Washington. Makes a nice catch over the middle with Marsh all over him. Defense maybe getting away with some grabbing here and there. Hopefully not bad habits forming. 9:40am: Sun is heating up. More offense on defence coming up! Great practice, lots of intensity! 9:50am: I’ve been to a few training camps and this is the most physical I have seen the Lions ever. Guys are getting popped! Andrew Harris rips off a nice run. 10:07am: Punters are getting at it. Both are launching it but Whyte has more distance early. Of course placement also counts and McCallum is the master. 10:15am: Aaron Hunt slow to get up after some big contact. Attended to and walks off unser his own steam. He’s fine. 10:17am: Offensive line is opening up some nice holes for the backs. Robertson with a nice run followed by a 65 yard romp by Harris. 10:23am: The secondary looks very agressive this year. Really getting after the ball. Dante Marsh is looking very strong. 10:27am: Another fight. Sorensen and Gibbs exchange blows and Walby Junior gets in a big shot. Extremely physical camp. Gettin after it in BC. 10:38am: things are throttled down a bit with some field goal and special teams work. 10:41am: Players gather at midfield as practice for the morning session is in the books. Another great physical session. Standouts: Washington, Harris, Davis, Marsh, Printers, and the improved play of the offensive line. Both sides were getting after it! Thanks for following along! We’ll have photos of today’s morning session and we’ll be back to keep you posted in the afternoon! Spread the word!